Automotive Repair Tools Your Should Have in Your Vehicle - autopom! Despite our best efforts, breakdowns happen, so having some basic automotive repair tools in your vehicle can be very helpful when you find yourself stranded on the side of the road. Many breakdowns are a result of minor problems that can usually be fixed roadside. You can avoid the inconvenience of long waiting times when you are prepared to make a few simple repairs yourself, even if it is only a temporary fix that will get you to a nearby garage. And, you can also save a lot of money if you don’t have to pay a mechanic a costly service fee to change a flat tire or replace a blown fuse. For safety reasons, major repairs should not be done on the side of a busy highway, but being able to repair small issues yourself will get you back on the road and out of harm’s way quickly. Safety triangles or emergency flares. These are not “tools” but they are very important in letting other motorists know that there is a problem ahead and they should drive with caution. Before attempting any repairs on your vehicle, make sure that some type of emergency indicators are placed at least 150 feet behind your car. Spare tire, jack, and wrench. While all cars are equipped with these items originally, it is a good idea to make sure that everything is still present and in working order. You do not want to be stranded with a flat tire only to discover that the spare is not inflated or someone borrowed your jack and didn’t return it. 12-volt air compressor. Most fuel stations have air pumps, but unfortunately, soft tires do not always occur with a service center in sight. If you are in a very inconvenient location or your tire only has a small leak, you can pump it up enough to get you to a repair shop. Car repair tool kit. Many stores sell these pre-packaged with everything you need to fix your vehicle in an emergency. 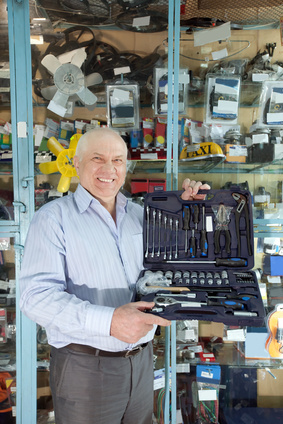 Some are more extensive than others, but most typically include tools such as screwdrivers, pliers, adjustable wrenches, sockets, and even wire brushes and spark plug grabbers. Tape. You should have a roll of electrical tape for repairing wiring problems, and a roll of duct tape for jobs such as fixing leaky hoses or reattaching mufflers. Jumper cables. If someone is willing to stop and assist you, your car will be running again quickly. And, you will also be able to help others when they are in the same situation. If you don’t want to depend on the kindness of others, you can purchase a battery jumper, but make sure that it is always recharged and ready to use. Caution: Jumping a battery to start a car can be dangerous. See our blog post on this topic. Basic fluids.You should ideally have an extra bottle or jug of coolant, engine oil, windshield washer fluid, and brake fluid. Empty fuel can. This will be helpful when you run out of fuel and have to walk to a nearby station. Never carry a full gas can in your car. Gloves. Working on a car can be messy, so it is a good idea to have a pair of work gloves, and possibly even an old shirt or coveralls. If you live in a colder climate, a warm hat and scarf will make working on your vehicle much easier – or at least more comfortable, so add these to your auto repair kit. A roll of paper towels or small package of wipes will also be helpful. Flashlights and batteries. When visibility is poor, you will need a flashlight to identify and fix the problem. It will also be useful if you have to walk to a service station or roadside phone. Make sure to always have an extra set of batteries. Mobile phone charger. While this isn’t necessary, it can be helpful in making sure that your phone is always charged and ready to use when you have to call for help. First Aid kit. If your breakdown is the result of a minor accident, you will be able to clean and cover cuts and scrapes. A first aid kit can also come in handy if you happen to injure yourself while making repairs to your vehicle. Folding shovel and safety salt. For drivers who live in colder climates, these tools are invaluable when your vehicle is stuck in snow or ice. Fire extinguisher. A car fire extinguisher is useful to quickly put out or prevent fires. WD-40. This will help loosen those nuts and bolts that are seized or rusted. Owner’s manual. This contains important information and diagrams about your vehicle. It is a great “map” that can help you diagnose and repair your car. It also includes recommendations for regular maintenance that will reduce the risk of breakdowns. Contact information for your extended warranty or vehicle protection plan. A vehicle protection plan provides you with all the help you need when dealing with unexpected breakdowns. While your automotive repair kit may allow you to fix minor issues, it is nice to know that you have coverage when a mechanic or tow truck is required. Keep a copy of this information handy so you can contact them when you need help. Vehicle Protection Plan. If your vehicle requires major repairs you may want to call your extended coverage plan company. autoPOM!’s Exclusionary Vehicle Protection Plans cover virtually all your vehicle’s mechanical and electrical components (per the terms of the agreement). In the event of a roadside auto breakdown, having a vehicle protection plan (commonly called an extended warranty) can really help. All autopom! extended coverage plans come with roadside assistance including towing, lost key/lock-out services, emergency fuel service, etc. While your automotive repair kit may allow you to fix minor issues, it is nice to know that you have coverage when a mechanic or tow truck is required. This may seem like a long list, but your car will not be packed to overflowing with automotive repair tools. In fact, most of these items will fit nicely into a toolbox or bin and can be placed in the trunk of your vehicle. Smaller items such as the owner’s manual, flashlight, and insurance information can be kept in the glove box. When you experience unexpected breakdowns, having a few automotive repair tools can save you both time and money. Request a free, no-hassel quote from autopom! today!